The Microdungeon 10 experiment is completed. 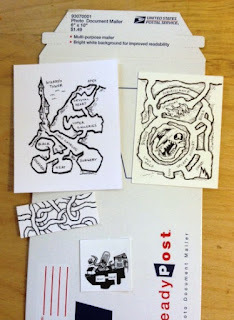 Today I (finally) mailed 9 microdungeons to the folks who requested to them. 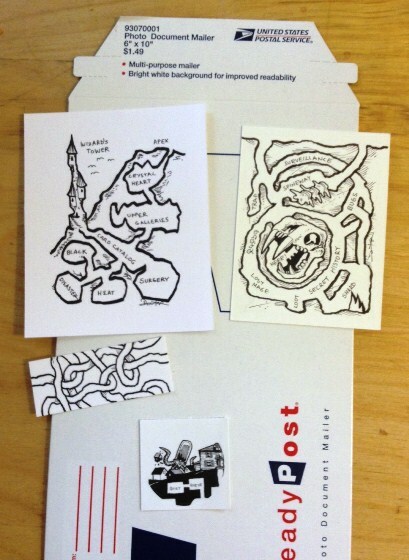 I've also thrown in a few extra goodies: a print of The Wizard's Tower, a couple of Moo cards, and a sticker with dungeon art on them. So what was the point of this exercise? With shipping and materials, I only made a few bucks on it. On the other hand, I created 10 new dungeons I wouldn't have created before and found owners for them. This is a huge win for me! With dozens of homeless dungeons sitting in little boxes on my desk, a piece of art I can send off to someone makes me happy. Homeless dungeons make me sad. The only downside was how long it took. Even though each dungeon is quick, it took me a month to complete them all. This is because I do most of my sketching in the 45 minutes between dropping my daughter off at school and starting work every day. And that time is subject to disruption from work emergencies, family duties, errands, dental appointments, other art assignments and a host of other obstructions. The next time I do something like this, I'll carve out a block of time to work on it so I can get it done in a more timely fashion. That said, thanks for taking part everyone. I hope you enjoy your new dungeons! Cool. Looking forward to them. Thanks for posting about the process to!